You can add a custom decorative hinge strap to any of our custom doors. These old world style decorative hinges are the perfect compliment to any of our castle and cathedral door offerings. Like all of our custom door hardware, they are custom made to order in any size, style, or finish that you choose. These decorative straps are built by the hands of our expert blacksmiths. Each ornamental hinge is hand hammered by master blacksmiths over a coal fired forge using tried and tested techniques. Additionally, we build all of our hardware products from pure solid wrought iron. Unlike other metals, wrought iron will not corrode with exposure to the elements. This makes for a piece of hardware that will stand the the test of time, while requiring little or no maintenance. Anvil hammered and hand patina finished, we guarantee our custom hardware will never erode, and will stay beautiful for generations. We make the finest custom door hardware available anywhere at any price. Master blacksmith hand forged wrought iron construction, and heat infused patina finishes makes for a hardware product that will stand the test of time with little or no maintenance. Your guests will marvel at the charm of your custom full span strap, built to fine art specifications. The custom decorative hinge strap is designed to give your door the perfect medieval style accent without overwhelming. They features decorative iron clavos horizontally down the center of the strap for an authentic, old world look. These custom hinges feature a hand hammered texture. This texture is not stamped, cast, or machine made. These hinges, and all of our products are a genuine one of a kind, that will never be exactly reproduced. They are built the old fashioned way, with fire, hammer, and anvil. When you purchase our medieval door hardware products, they are made using the same techniques and materials that would have been used in the Middle Ages. Historically correct methods and materials are especially relevant when creating a fine art quality product. Don't settle for low quality reproductions when you can own a genuine, handmade piece. At ArtFactory.com we build all of our custom hardware, including pulls, knobs, handles, slide locks, and decorative iron clavos using the same old world materials and techniques. 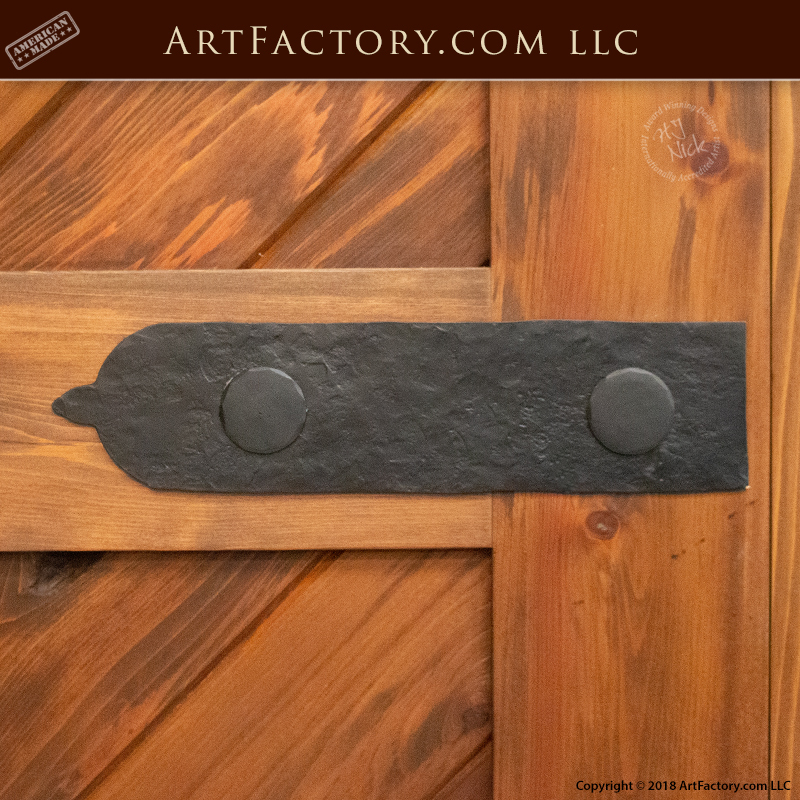 All of our custom door hardware is finished with a hand applied, iron oxide, advance patina. This patina is hand applied, then heat infused at over 1000 degrees Fahrenheit so that the finish actually becomes part of the metal. This means a finish that will stand the test of time and look better with age. Because our finishes actually become part of the metal, they will never crack, flake, or fade like powders and paints. Every product from ArtFactory.com is designed by, and built under the supervision of award winning artist H.J. Nick. Nothing leaves our world class facility without the signature of H.J. Nick. This coveted signature is only applied to a product after all inspections have met our fine art world class standards. The signature is sometimes also dated with the first design conception date. This certification and signature ensures you of a product that is of investment quality, and will have future appreciable value in antiquity. At ArtFactory.com, our combination of fine grade materials and master hand craftsmanship allow us to offer a quality of product that is unmatched anywhere at any price. In fact, we are so confident in our products that we guarantee everything forever. Call us today at 1-800-292-0008 for pricing on our custom decorative hinge strap, or any of our fine art quality custom hardware.